Description Imagine a tiny church at the edge of wilderness Before Philadelphia, there was a village named Wicaco. Before William Penn, the Swedes were here, building log homes and a church they named GLORIA DEI. Imagine William Penns Philadelphia rising Hand-hewed logs vanish in favor of locally baked brick. The Swedish log GLORIA DEI removed to be replaced by a new church, christened in brick. 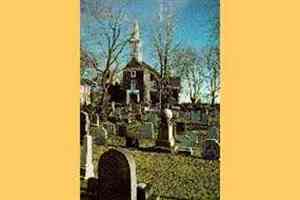 Imagine the transformationtown becomes citythirteen colonies become one nation... Lutheran GLORIA DEI becomes Episcopalian The tiny church was almost lost in the nearly endless sea of tall masts standing shoulder to shoulder along a busy waterfront only yards away. The sound of a thousand hammers beating against nail and wood could be heard as new ships rose on the waterfront; modest middle class houses and shops rise opposite where there was once field and forest. Affectionately referred to as OLD SWEDES, the memory of the long-vanished Swedish settlers is not forgotten. Now imagine OLD SWEDES in the modern worldan oasis surrounded by a sea of concrete and steel Stroll among its cemeterys weatherworn tombstones to re-discover Patriots and ordinary citizens buried side by side so long ago. Enter the tiny church and feel three hundred years of history welcoming you. Add Gloria Dei Church National Historic Site to your free online travel itinerary.